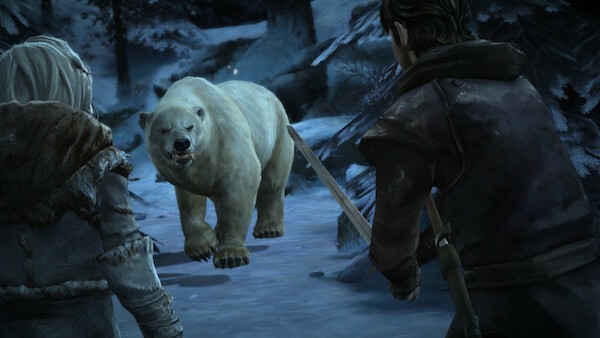 Telltale’s take on the Game of Thrones universe might well be the best interpretation in videogames yet… but the competition was pretty poor to begin with. 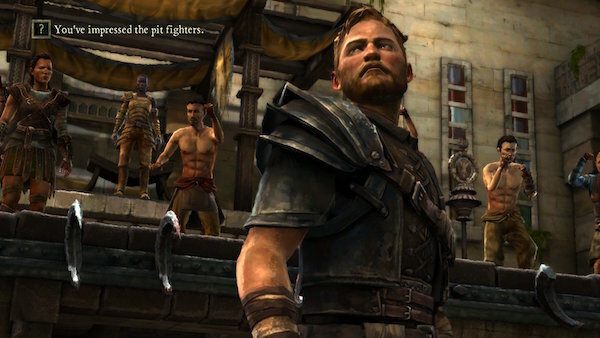 elltale’s take on the Game of Thrones universe might well be the best interpretation in videogames yet… but the competition was pretty poor to begin with. Spanning a lengthy 6 episode series, this sees you take on various roles with-in the Forresster household. A distant family of northern ‘Ironwood’ producers that are mentioned briefly in the books so Telltale has the freedom to weave them through the existing story lines as they see fit. Taking place a little while after the events of The Red Wedding (but before the *events* of the Royal wedding in King’s Landing) we’re once again thrust into the heart of The Game of Thrones. As the formidable character Cersei Lannister says “… you win or you die”. Telltale have done a great job of recreating the look and feel of the TV show on which this is based whilst pulling in a little more of the pace and lore of George R. R. Martin’s original novels. They’ve also managed to recreate a lot of the angst and anxiety associated with the show too. You know if it’s a Game of Thrones production that you should never get attached to a main character! It truly is a bleak affair, with Telltale’s comic-book look lending itself well to this world. That said they do employ an odd “fuzzing” technique, I presume to age the look or make it look more like a painting, that sometimes works and sometimes doesn’t. Animation is still a weak area of these games. You are presented with a the myriad of dilemmas, as the plot weaves and twists over the course of the games 12’ish hours of play, as you’ve come to expect from Telltale’s way of doing things. The issue here is that many times throughout the series decisions, that you likely agonised over, turned out to either be futile, undone or playing into inevitability. Pull back the curtain far enough on this type of system and you can usually see the cogs turning but Game of Thrones does a particularly poor job at obfuscating even the simplest of mechanisms leading to a feeling that you really are just being funnelled down a specific path. That in itself takes away from the overall merit of the series. What of those merits though? The game does a great job of weaving through existing structures. The tone, look and sound of the world will be immediately recognisable to fans of the show. Solid voice work from the new cast and some mostly solid voice work from existing characters from the TV show. Having these high-profile characters (and actors) brings a sense of legitimacy to the series but, at times, they feel shoehorned in. That said who doesn’t appreciate a little quality time with Peter Dinklage (ignoring Destiny!) or Natalie Dormer? 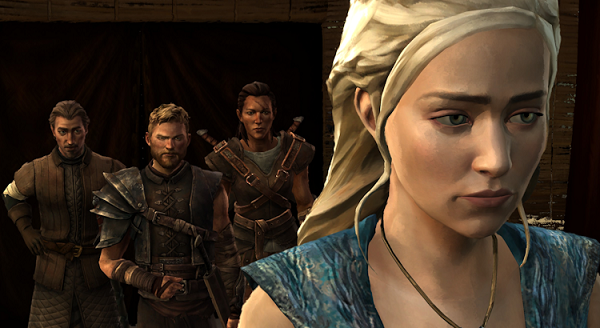 What strikes me the most, as a fan of both Game of Thrones and Telltale, is just how by-the-numbers this series feels. On its own, it’s an OK adventure series. For a fan with no knowledge of Telltale’s work it’s likely a good experience. For those familiar with what Telltale have been putting out over the past 18 – 24 months this feels stale compared to their other works. Some of the writing is top notch and some is bland or just extreme for the sake of it. It’s these highs and lows that make Game of Thrones: A Telltale Series so hard to pin a score on overall. Some episodes are so-so, some are great. Moments of solid gaming are then let down with some contrived mechanic or the unravelling of a choice. I think the series hit its high-point around episodes 3 and 5 with the final episode setting up some mediocre cliffhangers and bulldozing over a lot of choices made throughout the series. The back and forth between so many characters, especially those in King’s Landing, just seems so futile in the end. That said some excellent work using Ramsey Snow/Bolton as the instigator of the Forresster’s woe is well used. There’s a lot to be enjoyed here for fans of the HBO show or general fans of the Game of Thrones / Songs of Fire and Ice series. The rinse/repeat cycle of previous Telltale titles wears ultra-thin here and more than any other Telltale title you can see the mechanics under the hood. Choices are brutal and often have horrific consequences for your character their world. That said the choices just seem to be superfluous in so many ways. There’s always an ultimate “path” that Telltale games must tread but Game of Thrones feels more like you’re being railroaded than guided. With games like Life is Strange and Until Dawn taking this to a new level this year it’s even more obvious. Such a shame in comparison to the superb Tales from the Borderlands and the quirky Minecraft: Story Mode. Intense and extreme violence and blood – seriously guts are spilled , skin is flayed and eyes gouged out!